China is quickly transitioning away from paper currency, with nearly everyone in major urban centers using smartphones to pay for almost everything. 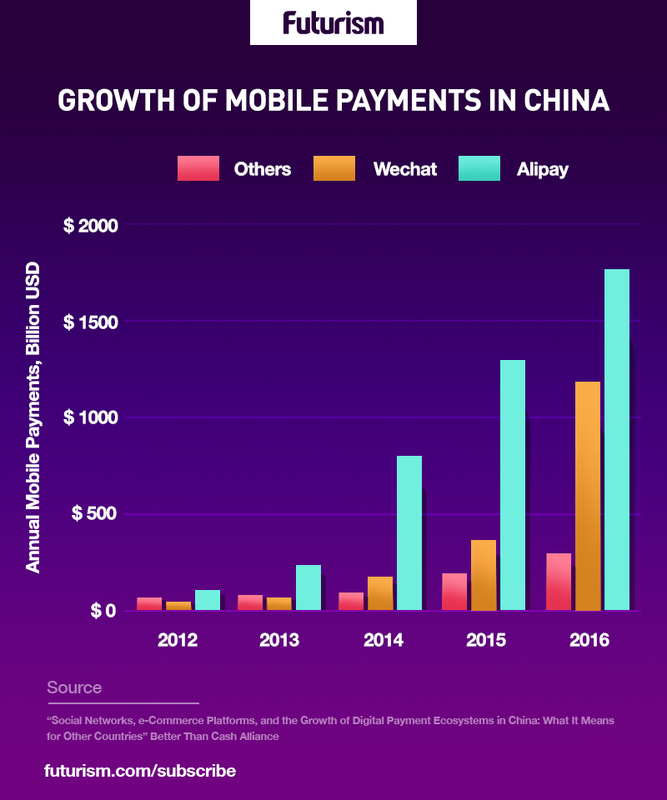 Alipay and WeChat are the two dominant technologies in use in the country, and they are eclipsing cash almost completely as a payment option. Three years ago, everyone was still using cash, but the transition to digital payments has happened rapidly. According to consulting firm iResearch , in 2016, mobile payments in China were worth about $5.5 trillion, approximately 50 times the United States’ $112 billion market. Tencent and Ant Financial (the parent companies of WeChat and Alipay, respectively) collect payment data from users, and they also charge both users and the companies being paid for their services — services that require very little in the way of overhead as they involve neither card readers nor interactions with banks. As a result, Tencent’s 2016 Q4 revenues from “other services,” which includes mobile payments, tripled from 2015 to reach $940 million, and both they and Ant Financial are poised to surpass Mastercard and Visa in total daily transactions by 2018. Cash-free campuses in cities like Tianjin allow students to pay all of their expenses, from tuition to meals, with their smartphones, making even physical student IDs obsolete.If implemented countrywide, these kinds of plans could save colleges an estimated 300,000 yuan ($44,034) per year in production costs for cards and 10 million yuan ($1,467,825) in annual card loss costs. Digital payment technology linked to smartphones is also being used to improve health access in China and reduce notoriously long wait times in clinics. Digital payments are part of the “green finance” project being piloted in China. Cashless technology is a green finance principle because it is more efficient. According to the World Bank , businesses and governments can cut costs by up to 75 percent using digital payment programs. China is especially receptive to this kind of cashless transformation for several reasons. It has a huge unbanked population (about 12 percent of the unbanked adults worldwide are in China), a low rate of credit card usage (only about 16 percent penetration in 2014), and a lack of credit rating systems. Personal checks are largely obsolete in the nation, while digital options are widely available. China isn’t alone in going cashless. Coins and bills comprise just 2 percent of Sweden’s economy , and both Norway and Denmark have eliminated cash in most settings. The New York Times reports that cash was used in about 20 percent of all consumer payments in Sweden in 2015, in contrast to the 75 percent of all transactions throughout the rest of the world. India, too, is digitizing everything from payments to identification. A primary difference between the Scandinavian countries and China, however, is the use of debit and credit cards. Cards remain common in Sweden, with almost 2.4 billion such transactions taking place in 2013. In China, cards are rarely used, and the transition from cash skipped straight to digital apps. These are gaining ground in Scandinavian countries, though, with everyone from street vendors to churches making use of digital payment apps on smartphones. The move toward digital payments and a cash-free world has its critics. With local users locked into two platforms in China, for example, it is hard for tourists and other visitors to pay for anything. This could deter foreign businesses from coming to China or anywhere with more specialized digital payment platforms. Furthermore, digital payment options bring with them privacy issues and cybersecurity concerns. The ability to track payment data and restrict access to money, for example, is a real concern for many users, especially when the government is the one in control. However, for a host of reasons, the cash-free transition appears to be imminent. Ideally, we can make the transition a positive one by focusing on technologies, such as blockchain , that will ensure these transactions are private and secure.